We have had spring like weather the past two weekends so I opted out of finishing touch ups of the beams to spend time with my men. I hope that you will continue to be patient on the reveal. You will get a feel for them in this post though! I did however change out our Valentines Mantel to an every day french country look. I ordered this picture from Joss & Main last week and was surprised at how quickly it arrived. It was just $45 and I had a $15 credit so it was a win win. I kept out the candle sticks that Mr. Front Porch and I received as a wedding gift and added a little clock that the Papa made for us. 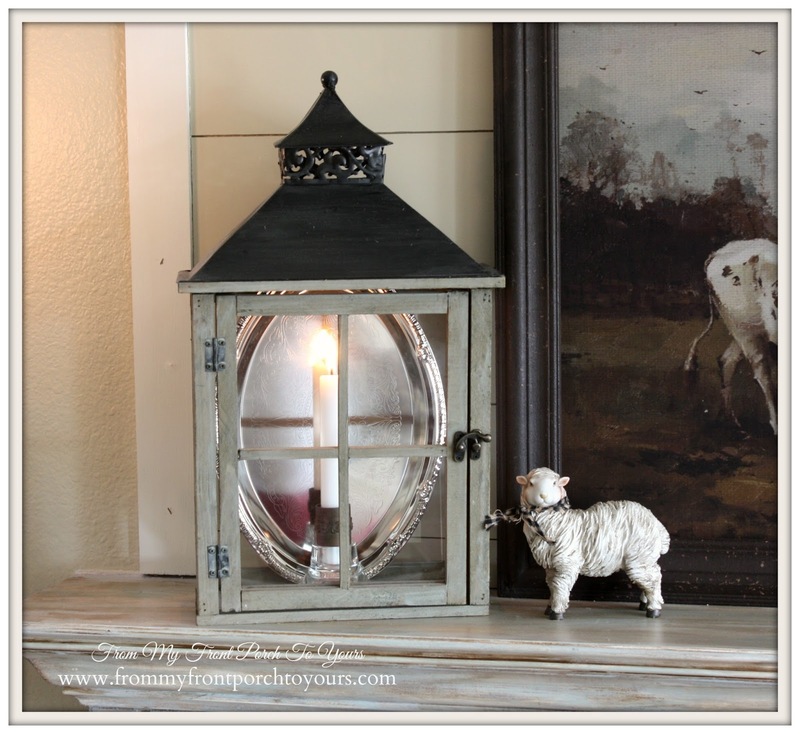 My most favorite lantern made a return as well as a little sheep that my mama gave me for Christmas. I do not know if you remember or not but back in December I was sharing on Instagram and Facebook how Mr. Front Porch was helping make my Christmas present. Well here it is! I just love my vintage inspired hymnal board we made. I ordered the slides off of Mary & Martha. 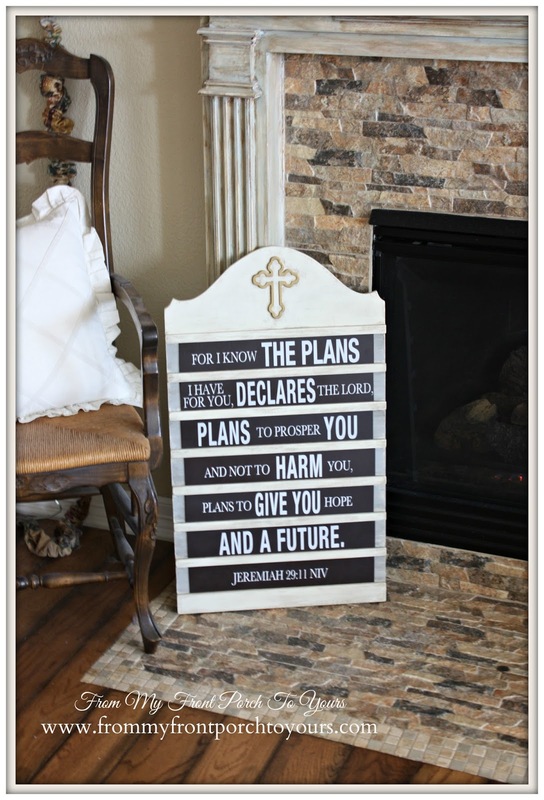 You can actually purchase a hymnal board from them as well but after I saw it on Hymns & Verses in Doreen's holiday decor I had to have one for Christmas and at the time the only way to get one was to host a party so we made on instead. 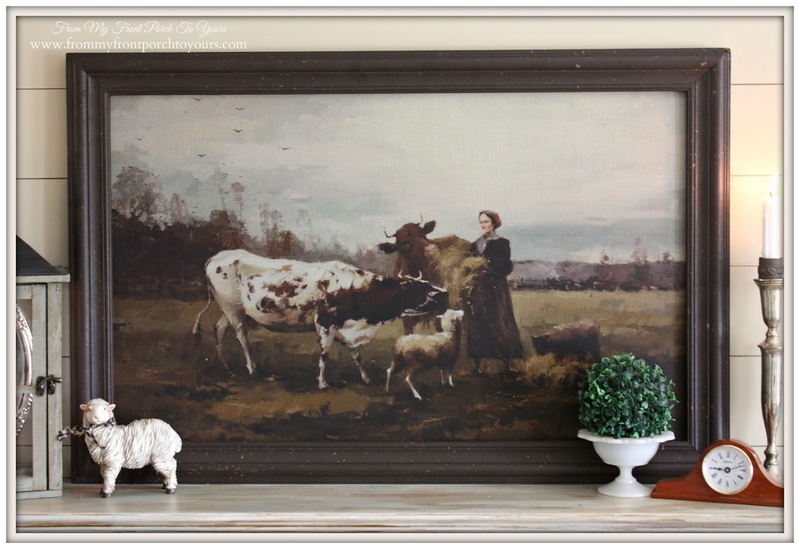 Such a sweet pastoral print. What a great painting you got from Joss and Main! 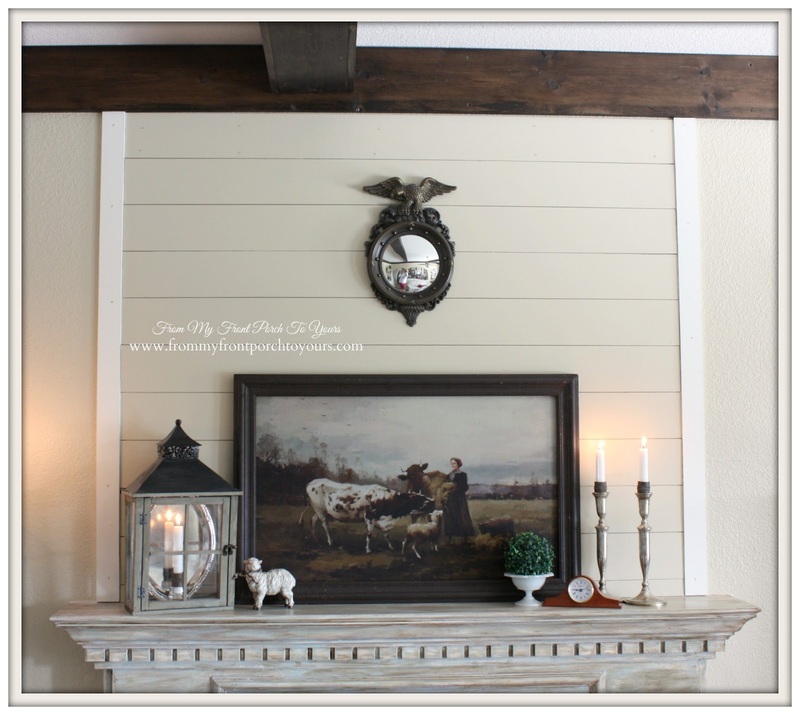 Love your French Country theme and the beams are looking great! Will you please share in your reveal a tutorial? I don't have instagram. Thanks! Everything is so cute! I love the painting!! Very pretty Pamela...LOVE that painting!! oh that print!! 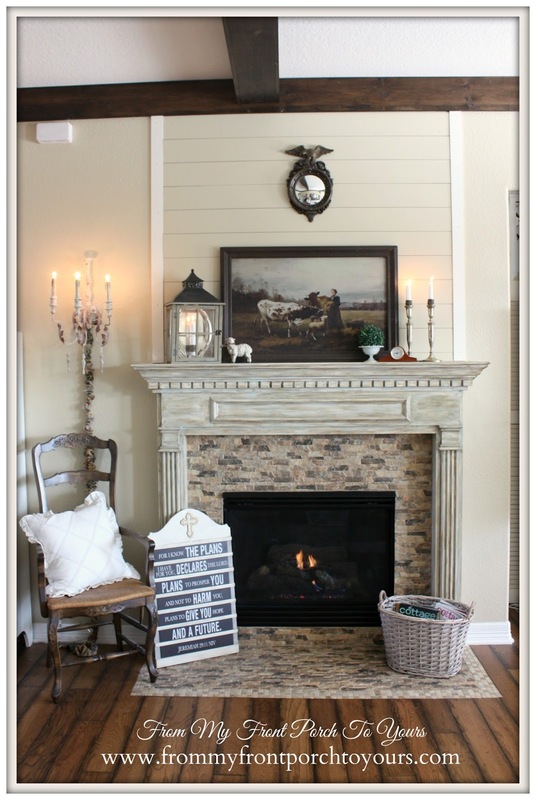 I'm in love, such a pretty mantel and that sconce is just amazing! Oh it's so pretty! I love the little sheep! Your mantel looks beautiful, Pamela! I just love that print and what a great price, even without the credit you had. I'm loving what I can see of the beams. I can't wait to see the whole room, but this looks really good. Very cute. I can't wait to see the beams. 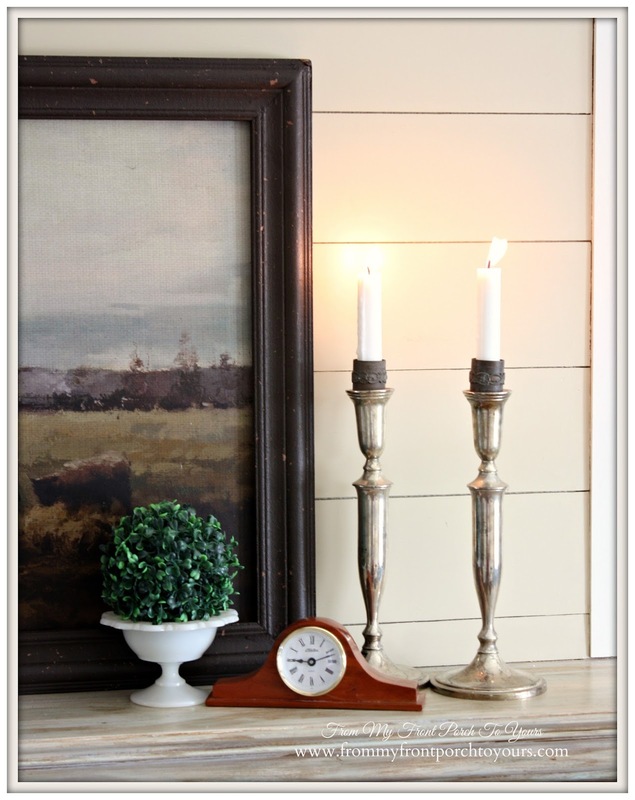 Your mantel vignette is gorgeous!!!! Your new picture is soooo beautiful....you got a fabulous deal on it!!!! Lovely! I like the picture with the simple arrangement on the mantel. Well done! Ils a wonderful home, it lives In Awwwww !! Pamela, your mantel is lovely! Your hymnal board is fantastic and has one of my favorite scripture verses in it. Love you painting! You have created a wonderful vignette! Oh, Pamela! Your hymnal board turned out wonderful! Great job!!! Love it! Can't wait to see the rest! That print looks perfect on your lovely mantel, Pamela! Love it! So pretty....and the candlesticks are gorgeous! Your mantel is just gorgeous! And those beams are wonderful. Sure enjoyed my visit this morning. I love that picture! I've seen that one for sale at a home interiors store down the road from me too. It's more expensive though so you got a great deal. 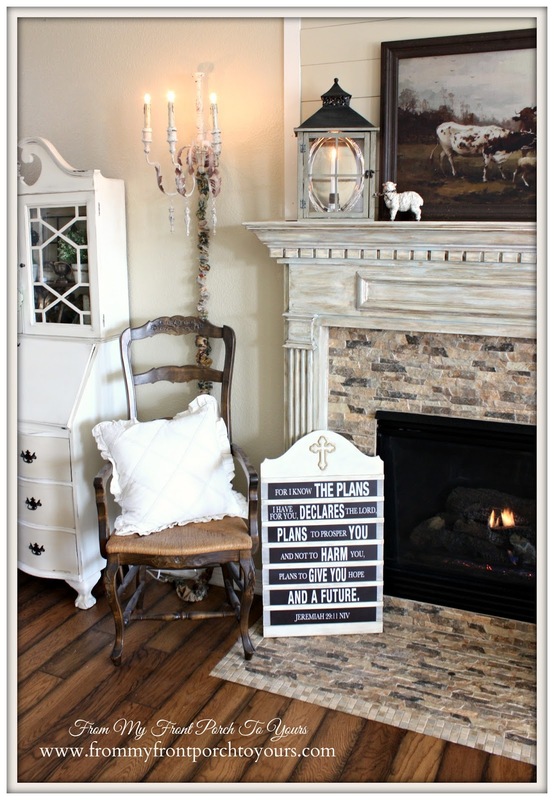 I love this mantel! Perfect styling!! Pamela, Love your mantel and the hymnal board is wonderful! What a great addition to your home. Thank you for joining the Share Your Style party and have a great weekend. Girl you are so talented! Your whole fireplace area looks fabulous. Mine is styled very similarly but I don't have the pretty chair, church attendance board, etc. Darn it! :) Love following your hard work and beautiful style on Instagram. Hey,love the mantle decor, but I thought this was going to be a tutorial on how to build that gorgeous mantle. (Sob!) Did you make it, or find plans online? If so, where so I can get? The mantel itself was put in by the builder. Over the years I updated it with the faux finish you see here in the pic and the shiplap above it. We also updated the surround with the rock tile that is pictured.